Hi Travis and the rest of the guys. How much of this is true about the Gallactic Alignment that ment to happen on 21st December 2012 and is it true about what could happen? Also what do you guys know of Planet X thats ment to be around at the same time? Message 24492 - Posted: 7 Jun 2009, 17:38:22 UTC - in response to Message 24488. It's as true as Y2K. Doesn't expecting the unexpected make the unexpected the expected? If it makes sense, DON'T do it. Message 24494 - Posted: 7 Jun 2009, 17:51:25 UTC - in response to Message 24492. Message 24504 - Posted: 7 Jun 2009, 20:30:09 UTC - in response to Message 24494. Message 24525 - Posted: 8 Jun 2009, 1:23:24 UTC - in response to Message 24492. Those that are left will have to survive Y2K38, of course. Maybe we'll be on the backside and Jupiter will be on the frontside as it crosses. If Jupiter blows up we'll know we're doomed. Firstly, planet X was a theoretical creation to explain discrepencies in the gas giant planets'orbits. Turns out our estimates of the masses of these planets were off and the most recent estimates negate the need for another mass to make the model make sense. Secondly, even if we assume that the Mayan calendar ends at 2012 for an astronomical reason (unlikely since the calendar is made to be "rolled over" each time it is completed, 2012 is the time for the 13th roll, meaning the Mayan calendar has ended 12 times already...) a galactic alignment is going to have about as much of an affect as the sign you were born under. Mathematically the doctor performing the delivery has more of an effect gravitationally than even the closest stars. Something to look at in these websites are phrases like "recent data collected BY IHC ASTRONOMERS, astrophysicists, ..." in other words these are not peer reviewed scientific papers or generally accepted hypotheses, otherwise there would be referenced works from other scientists and institutions. This ( http://adsabs.harvard.edu/preprint_service.html ) website is a reliable source of peer reviewed papers that both are referenced by other astronomers and reference other works. If you search that database for "2012 doomsday" you will find that the most scientifically accepted doomsday scenario revolves around dark energy and is estimated to happen no sooner than 10 billion years in the future. Message 24575 - Posted: 8 Jun 2009, 15:09:21 UTC - in response to Message 24572. 10 billion years in the future. This is a viral marketing scheme for the movie 2012. Similar to the marketing done by the movie Cloverfield where they claimed that ships were disappearing in Asian waters. Check out the footer on the IHC website. Message 24590 - Posted: 8 Jun 2009, 18:34:23 UTC - in response to Message 24589. In the last year a few sunspots have came about. It cycles. The planets aren't going to allign on that day, not even remotely possible. If you(anyone) thinks the universe will cease in a year or two then go hide. The Galactic Alignment is the alignment of the December solstice sun with the Galactic equator. 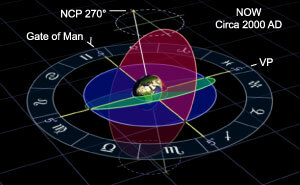 This alignment occurs as a result of the precession of the equinoxes. Precession is caused by the earth wobbling very slowly on its axis and shifts the position of the equinoxes and solstices one degree every 71.5 years. 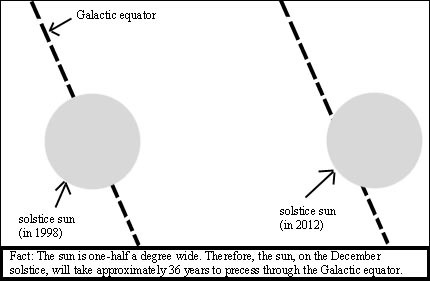 Because the sun is one-half of a degree wide, it will take the December solstice sun 36 years to precess through the Galactic equator (see diagram below). The precise alignment of the solstice point (the precise center-point of the body of the sun as viewed from earth) with the Galactic equator was calculated to occur in 1998 (Jean Meeus, Mathematical Astronomy Morsels, 1997). Thus, the Galactic Alignment "zone" is 1998 +/- 18 years = 1980 - 2016. This is "era-2012." This Galactic Alignment occurs only once every 26,000 years, and was what the ancient Maya were pointing to with the 2012 end-date of their Long Count calendar. Position A is where the December solstice sun was in relation to the Milky Way some 3,000 years ago. Position B is 1,500 years ago. And position C is "era-2012", when the December solstice sun has converged, as a result of the precession of the equinoxes, with the exact center-line of the Milky Way (the Galactic equator). 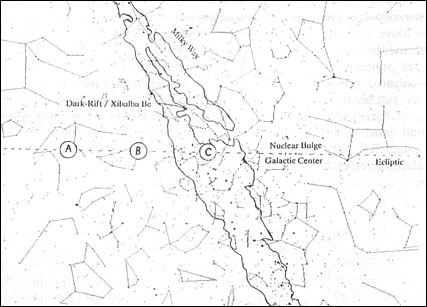 Notice that the place of alignment is where the 'nuclear bulge' of the Galactic Center is located. A long awaiting digital portrayal of precession and galactic alignments is now available on Nick Fiorenza's web site. Descriptions of the process are also there, but it should be noted that Nick describes what I refer to as "the solstice-galaxy alignment" with a preference for the equinox as the measuring reference. Thus, he speaks of the "Holy Cross" of the equinox axis and the Milky Way. The point is that "solstice-galaxy alignment" and "equinox-galaxy cross" refer to the same event. It is my hope that the these definitions will help to standardize the terminology so we can clearly discuss the rare precessional alignment that culminates in era-2012. I think some folks have too much time on their hands....or their hands on something else. Message 25991 - Posted: 19 Jun 2009, 7:48:28 UTC - in response to Message 24582. This 2012 thing has been around ALOT longer than the new upcoming movie "2012" I think you better get your facts straight, before criticizing something. To answer the OP's question...nobody here can say for CERTAIN what the future brings, but I'm sure if there's a planet heading towards Earth, NASA and the governments already know about it..but are keeping it hush hush due to panic. Sorry if this sounds heretical, but I think Youtube is the biggest waste of bandwidth on the planet. Ninty-nine percent of everything there represented as "scientific fact" is total kaka. OTOH, there is some actual scientific information posted to this thread, by nickth and others. Of course, that stuff is boring and hard to concentrate on. So what the heck...Maybe just go with Youtube, huh? Or watch ghost hunters on TV for awhile. For anyone who's read Dan Simmon's wonderful Hyperion books, I'd like to see Youtube get the same treatment the Fat Line got in those novels, i.e. shut down by unknown alien entities for being a wasteful abuse of the cosmos. Y2K? Please don't remind me! I was an IT manager then, and I can't tell you how many hundreds of hours my peers and I wasted on that one, looking for hoodoos. In the moderately likely case that I'm still here on 21 Dec 2012, and if the sky is clear, I'll step outside just before bedtime and check to make sure the stars aren't winking out or anything and have a good laugh. News Flash - Galaxy To Collide with Earth! Don't worry about planets or asteroids hitting us. The whole Andromeda galaxy is headed straight for the Milky Way, where we live, and nothing can stop it! Message 26047 - Posted: 19 Jun 2009, 22:25:11 UTC - in response to Message 26017. Message 26050 - Posted: 19 Jun 2009, 23:08:50 UTC - in response to Message 26047. You may get some work to crunch by then. Message 26059 - Posted: 20 Jun 2009, 0:12:38 UTC - in response to Message 26050. Message 26061 - Posted: 20 Jun 2009, 0:46:20 UTC - in response to Message 26017. Don't worry about planets or asteroids hitting us. I'm not claiming that a planet is going to collide with Earth..but that one might pass us by in its rotation around the milkyway. I love how people will discredit something without ACTUAL proof.